Mt. Kailash is a sacred destination for many people throughout Asia. The hiking tour around its base can be a life changing experience. Travelers learn about a variety of different cultures at once. TibetTravelExpert is gearing up to take travelers to Mt. Kailash during the upcoming Tibet travel season. Buddhists and Hindus alike have worshiped this holy mountain for thousands of years as the home of the Budda Demchok (also known as Demchog or Chakrasamvara) and Lord Shiva, the destroyer. Each year thousands of pilgrims make the ritualistic trek around the base of the mountain in hopes of having good fortune bestowed upon them. In line with their respective traditions, Hindus and Buddhist will circle in a counterclockwise direction while followers of the ancient Bon religion will do so in a clockwise direction. Mt. Kailash can be packed with pilgrims during certain times of the year so it’s best to book early. Once groups arrive in Tibet, their guide will meet them at the airport or train station. In the case that they will be coming from overland from Nepal, it is possible to arrange for the guide to pick them up at the border. Travelers should remember to drink lots of water upon their arrival, especially those coming from lower elevations. For this hiking tour, three full days of acclimatization are scheduled in Lhasa. During this time travelers will have the opportunity to visit important cultural sites such as Potala Palace, Jokhang Temple, and Norbulinka (the summer palace of the Dalai Lama). Also they will have the opportunity to visit Sera and Drepung Monasteries and then practice their bargaining skills in Barkhor Bazaar. Spending time in Lhasa acclimatizing is the perfect opportunity for travelers to see culture on tour. They also get to know their guide who will be leading them on the trek around Mt. Kailash. It takes three days of driving to reach the starting point of the trek. Along the way travelers will have the opportunity to gaze at the fantastic Himalayan mountain scenery. You will pass Lake Yamdrok, Karola Glacier, and Lake Manasarovar. You will learn more about Tibetan culture and Buddhism at Pelkhor Monastery and Kumbum Pagoda. Once the trek begins it will take three days to complete. Tibet travelers will be able to camp in tents or basic guesthouses along the way. For those looking to expose themselves to a diversity of cultures while taking in majestic scenery, the pilgrimage around the base of Mt. Kailash is perfect. Travelers can meet people with a wide variety of different beliefs and widen their perspective on the world. 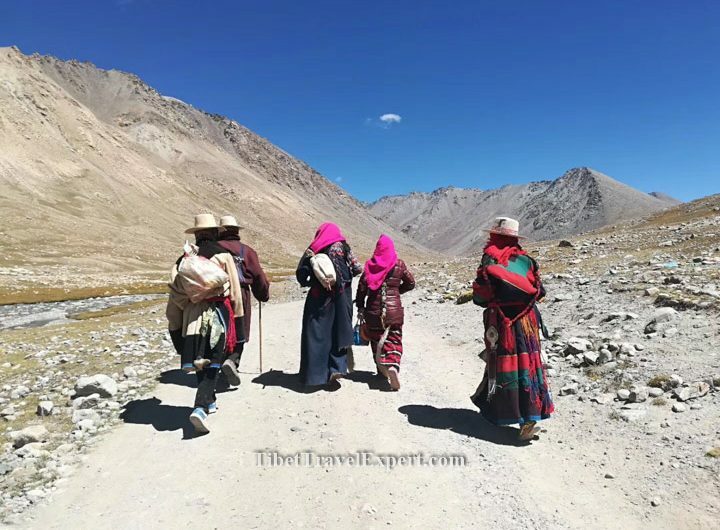 Many choose to end their Tibet tour at the border with Nepal and continue on to Kathmandu while some choose to return to Lhasa as a jumping off point for exploring China. A Tibet travel agent can assist groups in making additional travel arrangements. Don’t forget to book early, with the thousands of pilgrims that flock to Mt. Kailash every year, vehicle and guesthouse reservations can be hard to come by if not arranged in advance! So, if you’re ready to a life-time Tibet tour, our dedicated and professional teams are expecting you in Tibet! Please feel free to contact us to get the most useful Tibet tour advice for free!